CBL's high-yield bonds have recently sold off, thereby creating an opportunity for high income and attractive price appreciation. We acknowledge CBL's common equity has much more price appreciation potential than the bonds, but the common equity has much more risk too. We are not interested in owning CBL's high-yield preferred shares. 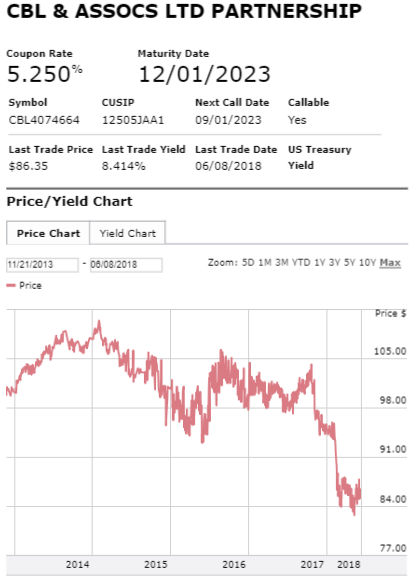 If you are looking for an attractive coupon payment, plus the prospects for some attractive price appreciation (perhaps far sooner than the bonds mature), CBL's bonds are worth considering. This article was originally released to Blue Harbinger members-only on June 8th. 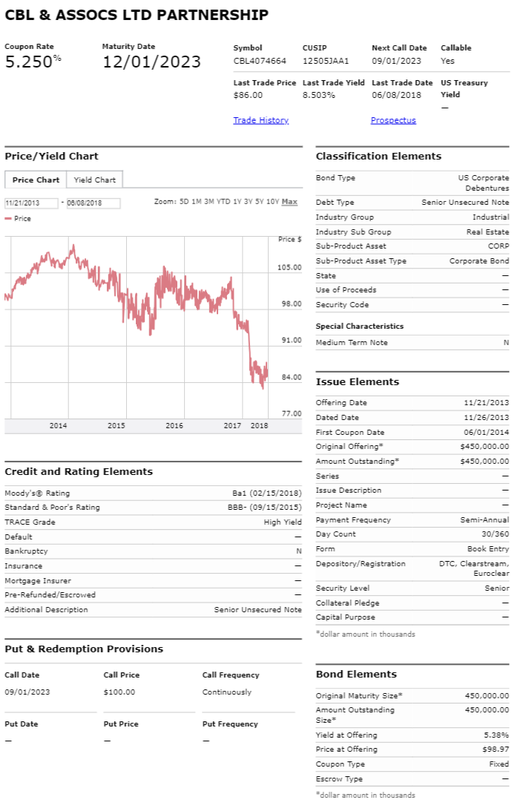 And depending on your situation, the 6.1% yield coupon payments on CBL's 2023 bonds (they pay a 5.25% coupon at par, but currently trade at a discounted price of 86 cents on the dollar, 5.25%0.86 = 6.1%) may be a far better investment option than CBL's equities (common and preferred), especially considering the bonds recently fell sharply to less than par (i.e. the 86 cents on the dollar thing), thereby providing the opportunity for a double-digit percentage gain in price (perhaps sooner than later) and that's in addition to the 6.1% yield, paid semiannually. If you don't know, CBL is one of the largest owners and developers of malls and shopping centers in the United States. And performance for this REIT has been terrible, as shown in the following chart. CBL has been dealing with a variety of challenges that have caused the price to decline dramatically. For starters, shopping malls have been facing new, growing, disruptive online competition from the likes of Amazon (NASDAQ:AMZN), for example. And it doesn't help that CBL's properties are not the attractive experiential A-class properties that command higher rents, more foot traffic, and less rent concessions. Rising interest rates pose another challenge for REITs like CBL. 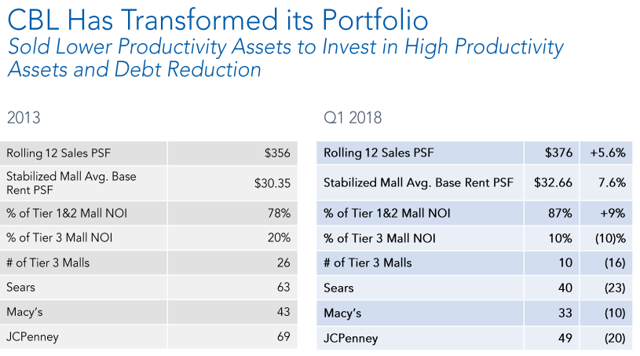 Because they are required to pay out most of their income as dividends, REITs rely heavily on borrowing to fund their businesses. Therefore, REITs (like CBL) can be particularly sensitive to rising rates (i.e. it increases their significant borrowing costs). Compounding this challenge, many market participants had been utilizing REITs as a bond-like proxy considering bond yields were so low and REITs offer relatively high income. 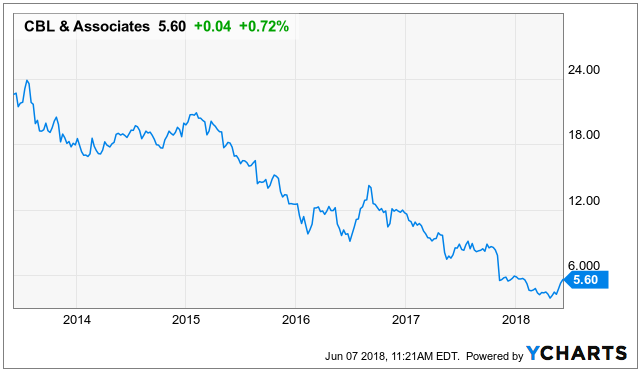 But as bond yields rise, REITs become less attractive to many investors, thereby putting further pressure on the market price of REIT securities. Finally, as many investors are painfully aware, CBL reduced its big dividend recently. And considering the shares have fallen so far, and the yield is so high, many investors are worried another dividend reduction (or worse) could be on the horizon. We'll have more to say about CBL's cash flows later in this report. With so much fear surrounding CBL's common equity, some investors are considering CBL's preferred stocks. CBL's series D preferred shares trade at a discounted $19.50 per share and offer a 9.6% dividend yield. And the series E trades at $17.52, also offering a 9.6% yield. After all, the preferred shares offer attractive yield, less historical volatility, and they're higher in the capital structure. And while all of these things are true, that doesn't mean the preferred shares won't get completely wiped out in a bankruptcy situation. Sure, the preferreds are technically safer than the common, but not that much safer, in our view. Plus the preferreds don't offer the same upside potential as the common if CBL actually is able to pick itself up by its bootstraps. 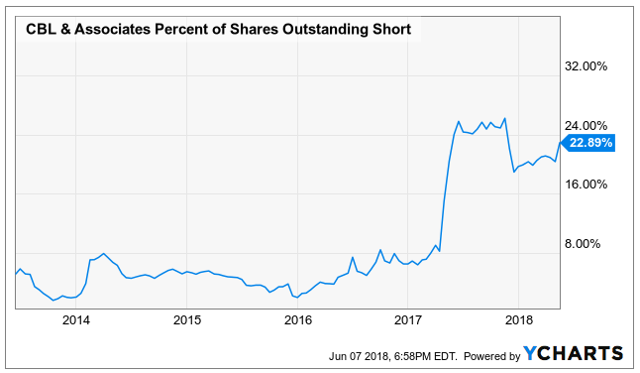 Further still, the preferred shares are particularly sensitive to rising interest rates considering the share price will fall as interest rates rise, ceteris paribus. However, unlike bonds, there is no stated maturity on the preferreds, so they can be even more sensitive to rising interest rates than bonds maturing in the nearer future. One attractive quality of CBL's bonds is that when they cut the common equity dividend, it freed up more cash to support the bonds. Like preferred shares, bonds are higher in the capital structure than common stock. However, unlike the preferred shares, the bonds' higher position in the capital structure (higher than even the preferreds) does make a significant difference because in a bankruptcy situation, bondholders are far less likely to get completely wiped out, and they may even be made whole if the equity shares are completely wiped out. 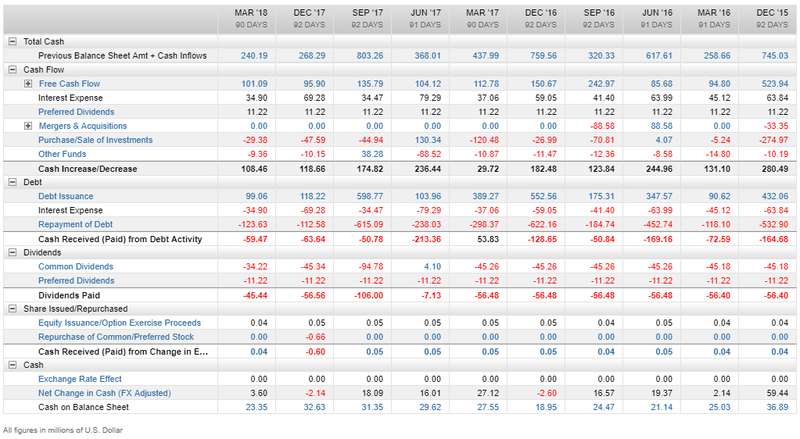 The higher position in the capital structure for CBL's debt is actually worth something quite significant, in our view. Before taking a position on the attractiveness of the various CBL bonds, it's worth considering the company's current and historical cash position. Cash flow levels are critically important to consider when dealing with increasingly challenged companies, like CBL. And for starters, here's a look at CBL's historical cash relative to debt servicing, dividend payments. As would be expected, the margin of cash after dividend payments has historically been tight. 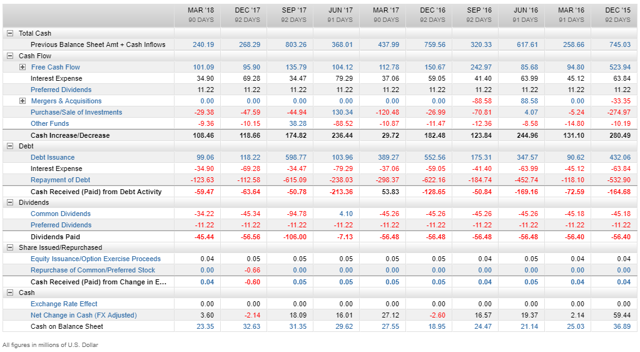 And for more detail, here's a look at the same data, only on a quarterly basis (instead of annual) and with more detail (including preferred versus common dividends, and debt issuance and repayments, for example) in table format. Worse still, cash flows will be challenged going forward as online sales continue to disrupt "brick and mortar" sales (e.g. CBL), thereby forcing continued retailer bankruptcies and rent concessions for many of those that maintain a brick and mortar presence (i.e. CBL tenants). These very real challenges, combined with considerable market fear, are a big part of the reason why short interest is so high for CBL. Further, most of the 16 Wall Street analysts covering the stock have a "sell" recommendation, and the group continues to lower its CBL price targets, as shown in the following graphic. CBL's challenges are also why the rating agencies have a negative outlook for the debt. If you're worried, CBL will run out of cash to pay the bonds, remember they've already reduced the dividend once to free up cash and can still do it again. Here's a look at recent quarterly cash vs. debt servicing and the dividend. It's a little lumpy depending on the date when the quarter ends vs. when the payments are made, but the point is the dividend continues to provide cushion for the debt. CBL's shopping malls aren't all just going to be shut down overnight. They're going to keep operating for years, and they're going to keep providing cash flow for years. And that cash flow goes to the debt first because it's highest in the capital structure. The sell-off has to do with fear. Specifically, the bonds sold off in sympathy with the equity when the equity dividend was cut. In reality, the dividend cut was a good thing for the bonds, in our view (because it frees up cash). Also, we suspect the bonds will rebound closer to par long before they mature in 2023. To put that in perspective, if these bonds rally back to just $98 (a price they traded near all of last year) that's a 14% price gain. And that's in addition to the big coupon payments you are buying at a discount. According to CBL's latest investor presentation, management is still fighting hard (i.e. this does not sound like a business that is going to disappear overnight). 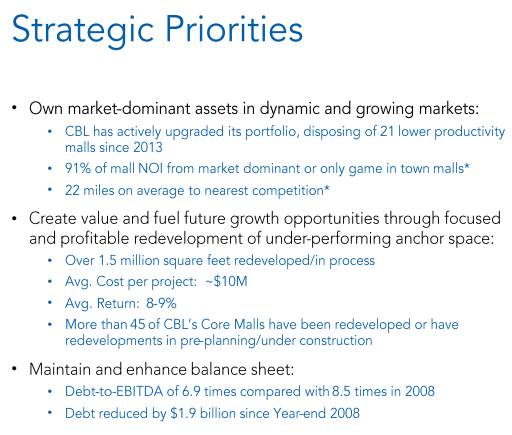 For example, here's a look at CBL's strategic priorities (note, enhancing the balance sheet is a priority - good news for bondholders). These are not the actions of a company that is going to disappear overnight. CBL is working to improve its long-term position, and this is very good for the bonds. As another good sign, CBL announced this week that it was able to obtain a five-year extension of over $110 million in debt. This is another good sign for CBL's outstanding debt, such as the 2023 bonds, for example. Plus, retailer bankruptcies are expected to lessen from last year, and retail sales have been surprisingly strong. Disclosure: I am/we are long CBL BONDS. I wrote this article myself, and it expresses my own opinions. I am not receiving compensation for it. I have no business relationship with any company whose stock is mentioned in this article.